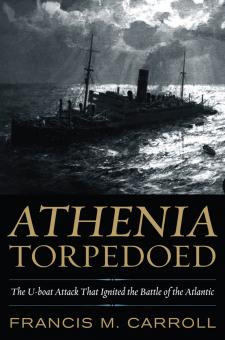 A new book published by The Naval Institute Press in Annapolis Maryland, that I have just received is, Athenia Torpedoed by Professor Francis M Carroll from the University of Manitoba in Canada. "Cynthia Harrison deserves special thanks for rescuing at an estate sale, and then making it available on Mac's Web Log, the only known copy of Judith Evelyn's vivid memoir of her experiences on the Athenia. "Mackenzie J Gregory in Australia created Ahoy-Mac's Web Log which is an extensive compendium of naval and maritime information, he has a special Athenia Page where he has amassed a substantial volume of information about the ship and its survivors." Nice to gain some recognition. 1. One does not live/serve on a ship, just as one does not live on a house, but in a house. One lives or serves in a ship. 2. To use the before Athenia is totally unnecessary Athenia on is own is all that is needed. Thank you so much for your note. I am impressed that you have a copy way off in Australia. The book only came out in mid-October and the UK edition is not due until 31 January next year. I was looking at your website just the other day and thinking I should inform you that the book is out. Let me know if there is any publication information that you need to list it. Your website has been an enormous help to me in doing the research for this book. The single most important bit of material was the copy of Judith Evelyn’s memoir that you provided. She takes a prominent role in my narrative of the experiences of the passengers. I wrote to you several years ago and got the name and address of Cynthia Harrison, with whom I have subsequently started a correspondence about the memoir. Evelyn turned out to have some Winnipeg connections that I was able to exploit and she also led me to Andrew Allan and his memoir and papers. However, but for your website I would never have been able to put their stories together. I will take note of your suggestions about usage. My conclusion is that writing is an unlimited opportunity to make a million stupid mistakes in public.